An interesting side dish ready in just 10 minutes. Halve the lemon, then cut away the flesh and discard it. Wash the rind in water, then slice it into very fine strips. Trim the beans and cook in salted boiling water for 3–4 minutes, until just tender, then refresh in iced water. Put in a serving bowl and add the preserved lemon strips. 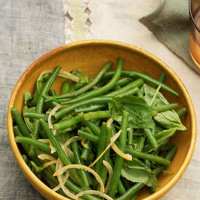 In a separate bowl, whisk together the vinaigrette ingredients, season and toss with the beans. Set aside for 5 minutes before adding the basil leaves.